Android Overlays: How Do They Compare? One of the many great things about Android is its openness--and by extension, its customizability. 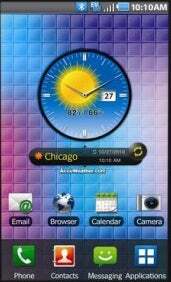 Unlike Apple's iOS, Android allows phone manufacturers to build overlays, or skins, that run atop the operating system. These overlays can change the look and feel of Android, and even add features not normally included in the stock build. Not all overlays are created equal, however. We'll walk you through the three most common skins and highlight the good, the bad, and the ugly of custom overlays. For people who find the social offerings of stock Android a little sparse and who would like to receive status updates at a glance, Motoblur is great. 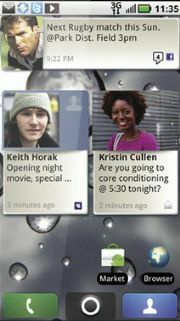 Motoblur offers a variety of widgets for keeping you connected to social networks such as Facebook and Twitter. Motoblur leaves most of the Android OS alone, but adds in neat features such as remote wiping (if your phone is stolen, you can wipe all the data from your Motoblur account on a PC), GPS tracking, and live widgets that can give you real-time updates on your various social networks. Motoblur backs up your data to its servers; if you do end up wiping out your phone, you can restore it by signing in to your Motoblur account. However, Motoblur can be quite obtrusive at times, and it can easily overwhelm your home screen with Facebook and Twitter updates. Motoblur replaces the native Android Gallery app with its own app, and strangely enough you can't access Google Picasa from the Motoblur gallery app. Picasa users out there may want to give Motoblur a pass. It's also important to note that Motorola toned down Motoblur to some extent on Verizon's Droid line of phones so as to make them feel less cluttered than other Motoblur-enabled handsets. The TouchWiz 3.0 overlay makes Android more colorful and visual, as well as easier to navigate. That said, it's also somewhat overdone--so much so that the result doesn't even look or feel like Android anymore. It is a bit cartoonish, and it lacks the elegance of HTC Sense. It also seems to slow down the phone's performance. All of the Galaxy S phones we've reviewed boast 1GHz processors, but we encountered issues: The phones lag when launching apps, flipping through menus, scrolling down contact lists, or navigating Web pages. TouchWiz is great for Android novices, however, because it offers a certain level of simple customization. You can have up to seven home screens to fill up with widgets and shortcuts; you can delete screens if seven is too many for you. And if you get sick of their order, you can easily rearrange them to your heart's content. With TouchWiz, you also get proprietary widgets and wallpaper in addition to the ones you find in stock Android. Like HTC and its Sense offering, Samsung has its own social media aggregator. Social Hub combines streams from your Facebook, MySpace, and Twitter accounts into a single view. It is a useful feature if you need a simple way to keep track of your networks. Another interesting feature is Mini Diary, which lets you create blog entries with photos, weather info, text messages, and more. You can post these entries to various social networks or send them to friends via text. After you create an entry, you press the Menu key in the bottom-left corner of the screen, and it gives you MMS (Multimedia Messaging Service) and Publish options. If you choose Publish, you can send your item to Facebook or MySpace. HTC's Sense UI is the biggest departure from stock Android. Sense feels polished and slick, giving the normally bare-bones OS a clean, sophisticated look. Everything from the app drawer to the unlock screen underwent a face-lift. Sense allows you to create "Scenes," which are essentially different home-screen profiles for various aspects of your life. For instance, you can create a "Work" Scene that removes all your social apps and widgets from your home screens in favor of more work-related applications such as GDocs or Quickoffice. Along with the standard Android widgets, HTC has included a handful of its own (which are as nicely styled as the rest of the interface). Our favorite among the HTC widgets would have to be the Friend Stream, which allows you to view all of your social networks in one unified stream and gives you the ability to post something simultaneously across your social networks. It's much faster and easier than having to go to each individual app and update your status multiple times. Another useful feature is the ability to pinch the screen and get a bird's-eye view of all your home screens. Still another awesome widget is the weather app, which accents your home screen with fun animations depending on what the weather is like outside (raindrops and windshield wipers when it's raining, for example). HTC Sense's Address Book is also an improvement over Android's address book. When you tap on a contact, you can see all of their recent activities and Facebook and Twitter updates, as well as the texts, calls, and e-mail messages between you and that person. One thing we don't like about Sense is that it can take a while to update your social streams--especially if you have a lot of people in your contact list. 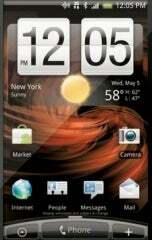 Overall, however, people who are sick of the plain-looking Android interface might do well to consider an HTC Sense phone. Although these overlays can be very helpful to certain types of users (newbies, social-media types), it's important to remember that handset makers have their own reasons for putting their own software over a phone's OS. The interface of a mobile phone is valuable real estate, and handset makers want their own brand there when possible. Because OS overlay software can be such a large part of the user interface, you should consider it when choosing a phone. If it might help you do the things you normally do on your phone, great--but if just creates clutter, you might be better off looking elsewhere.